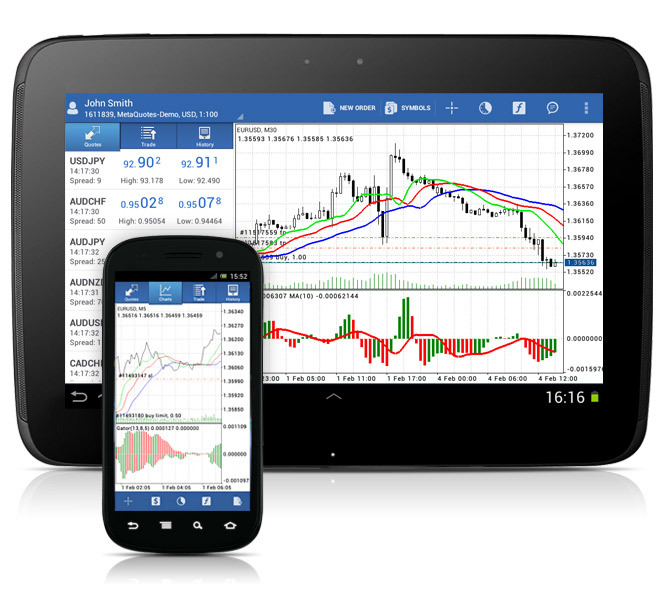 Manage your trading account using smartphones and tablets powered by iOS and Android OS. The application brings your trading account under your control and offers a variety of analytical tools and graphical display of quotes. All that is available to you anytime and anywhere! Using mobile terminals in daily activities offers a convenient way to keep up with your accounts when you don't have access to a desktop computer. In this situation mobile platforms are really indispensable, as their possibilities are no different from the desktop version of MetaTrader 4. Wherever you are, you can keep abreast with the market's latest developments, analyze them and perform trading operations on your account at any time. 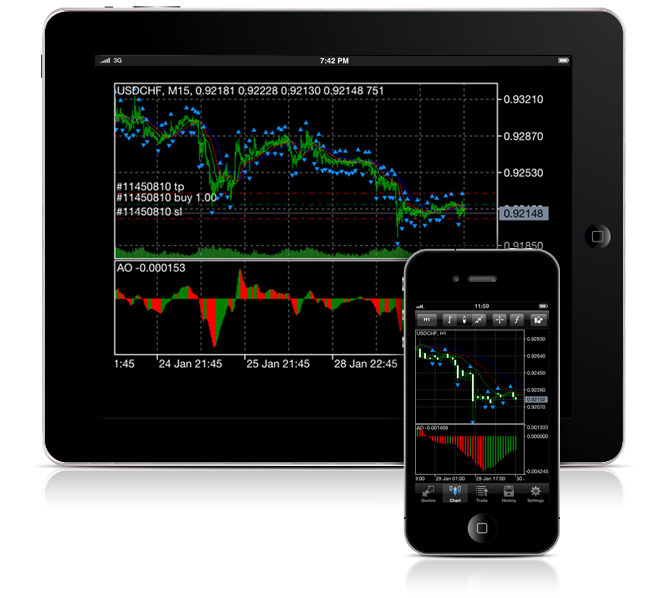 MetaTrader 4 for iPhone mobile platform is able to impress the traders of all skill levels by its broad capabilities. Fully functional Forex trading, wide range of technical analysis tools and ease of use in everyday activities - all these features are available in MetaTrader 4 for iPhone. Extensive analytical capabilities of MetaTrader 4 trading terminal for PC are now available for iPhone, iPod Touch and iPad. Interactive charts with deep history, scroll and zoom, as well as 30 technical indicators – all this is at your fingertips now. Do you want to analyze recent EURUSD quotes? There is nothing easier and it does not matter where you are: on vacation, on the road or in a restaurant. You will quickly master the program due to its intuitive and user-friendly interface. To start working with your account, select %BROKER_NAME% from the list of brokers, specify your login and password or create a new demo account. That is all you need to do to place the entire Forex in your pocket within a minute! System requirements: iPhone 3G/3GS/4/5, iPod Touch and iPad running iOS 4.0 or higher. MetaTrader 4 Forex trading technologies can now be downloaded on the devices powered by the popular Android OS. MetaTrader 4 Android offers the full set of trading orders, history of transactions and interactive charts. Wherever you are and whatever you do, Forex will always be with you. Integrated charts will help you to determine the current dynamics of symbol quotes, trading history will show you all your previous deals, while the powerful trading system will allow you to perform new ones. And all this can be done on the move! MetaTrader 4 Android is a modern solution for many traders imposing a variety of requirements for mobile applications. With MetaTrader 4 Android, you will receive a simple and user-friendly interface, fast performance and the widest range of supported devices. And all that is free! Follow a few simple steps to start working with your trading account using MetaTrader 4 Android. Download application, select %BROKER_NAME% from the list of brokers and specify your login and password or open a new demo account. The entire market is in your pocket now! System requirements: smartphone or tablet PC powered by Android OS 2.1 and higher. You can easily access financial markets from anywhere in the world, at any time and for free. Such possibilities are now available with our company!